A 24-year-old Kuwaiti-born man opened fire at two military facilities here Thursday, killing four Marines and injuring three others before dying from a gunshot wound, authorities said. The case is being handled as a terrorism probe, though officials cautioned they still hadn’t determined a motive for the shooting. The gunman was identified as Mohammod Youssuf Abdulazeez. While the Federal Bureau of Investigation has been monitoring hundreds of suspected supporters of Islamic State, people familiar with the probe said Mr. Abdulazeez, who resided in the Chattanooga area, wasn’t on their radar as a potential threat. Investigators are now scouring the details of Mr. Abdulazeez’s life, trying to determine if he had help, or if he had associates who also might pose a threat. 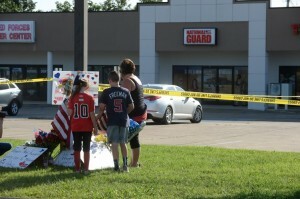 The first shooting began at about 10:50 a.m. when a gunman drove up and fired 25 to 30 rounds at a military recruitment center in a strip mall east of downtown Chattanooga, where one Marine was wounded, Pentagon officials said. The shooter then apparently drove 7 miles to a Navy Operations Support Center, ramming his car through a security gate, officials said. He opened fire around 11:30 a.m., killing four Marines and injuring a police officer and sailor, authorities said.